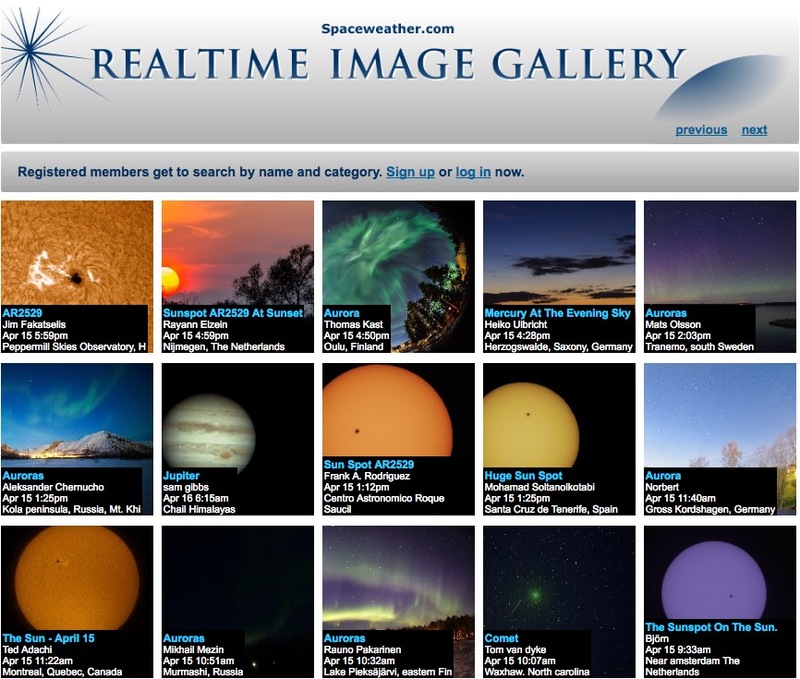 Previously, I shared a post about a conversation with my son about the rising sun viewed at different latitudes. During that conversation, we also discussed how the length of our shadow varied over the course of a year. In winter at noon in the northern hemisphere, when the sun is low in the sky, our shadows are cast long to the north. In summer, our shadows are shorter due to the higher angle of the sun in the sky. Imagine a plane extending through the earth at the equator. Extend that equatorial plane out into space. Between late March and late September, the sun appears above that plane. It reaches its highest extent in late June at the summer solstice. The sun appears at the elevation of the plane on the equinoxes in late March and late September. It appears at its farthest extent below the equatorial plane in late December at the winter solstice. 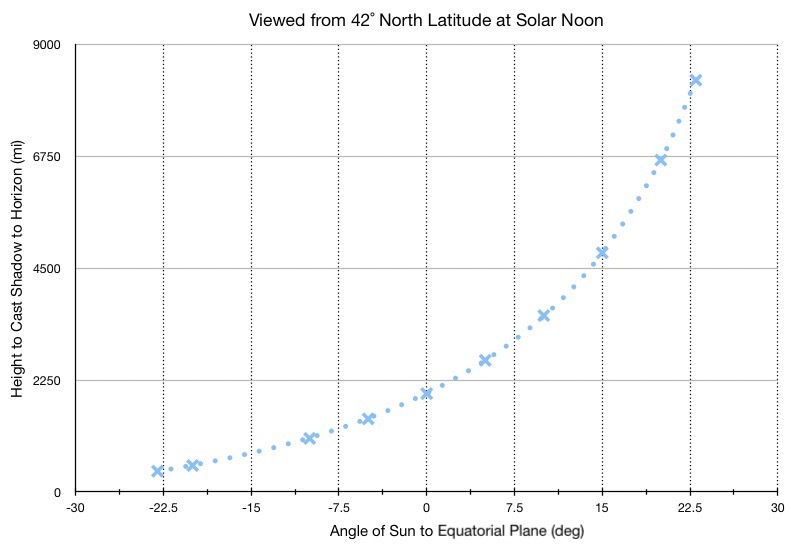 The farthest north and south of the equatorial plane reached by the sun is 23.5˚. Melanie and I live about 42˚ north of the equator. In the summer months, the sunlight direction is above the equatorial plane several degrees. Our short shadows are cast to the north at noon. 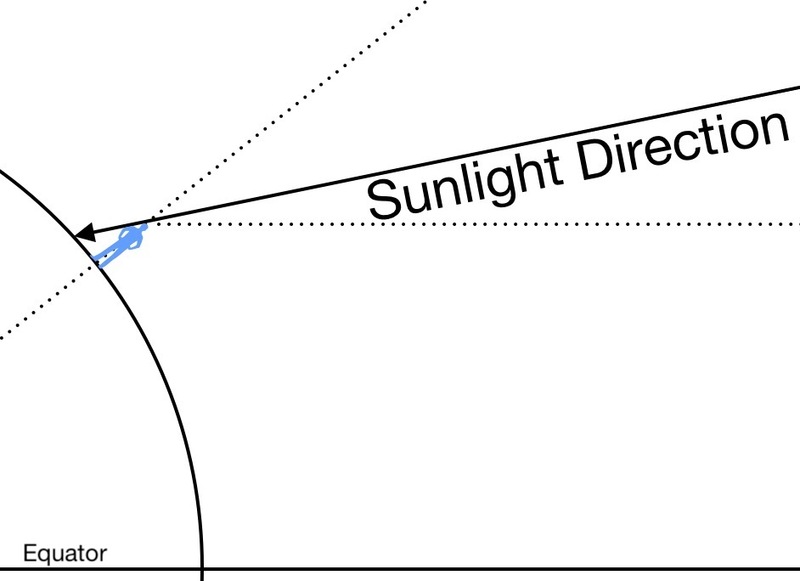 In the winter months, the sunlight direction is below the equatorial plane. Our shadows are cast longer to the north. The blue man in this figure is not to scale, but illustrates the concept of casting of shadows. My son wondered how tall you had to be to cast your shadow all the way to the north horizon at noon. I told him it was a simple geometry problem. He had to imagine himself very very tall like the big man standing above the little blue man in this figure. Those of you versed in high school math might recognize a right triangle in the upper left in this figure. Right triangles allow us to state relationships of certain side ratios to the measures of the angles. 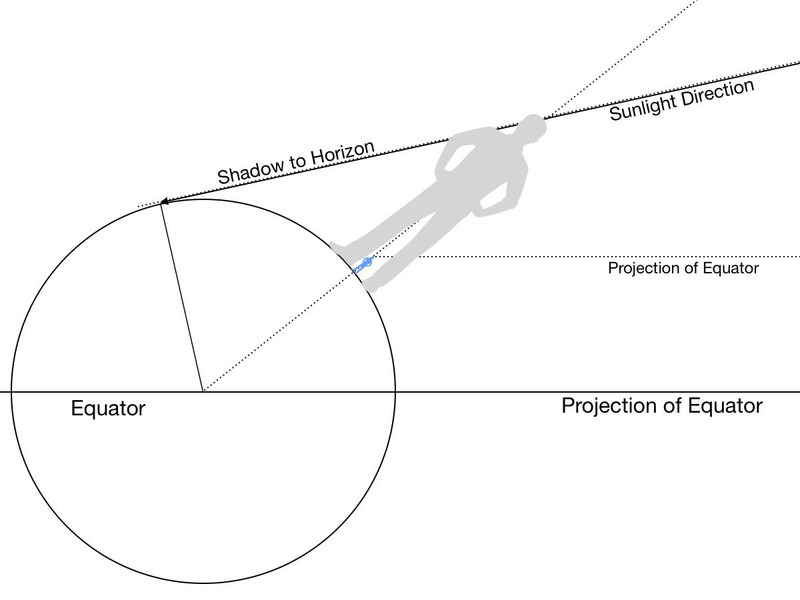 In the figure above, we know the radius of the earth (rE), the latitude of the person (Lat), the angle of the sun (𝛼) to the equatorial on a particular day, and can calculate the height (h) of the person from those values. This chart plots those heights for various sun angles between the winter solstice (-23.5˚) and the summer solstice (+23.5˚). For reference, the radius of the earth is about 4000 miles. The equinoxes occur at 0˚. In the winter, we already cast long shadows. We wouldn’t have to be as tall in winter as in summer to cast our shadow to the horizon. How would this chart look for an observer standing on the equator? Submit your solution in an email along with your account number so I can deposit the prize money if you are the winner.